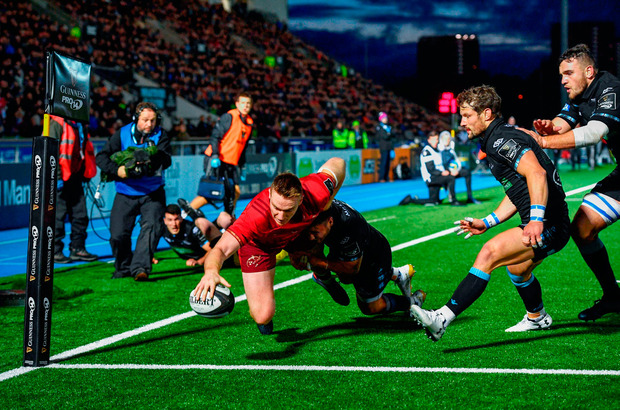 Glasgow rose to the occasion of what was billed as a top-of-the table clash by trouncing Munster at Scotstoun with a performance of exciting running rugby that produced four tries and complemented by a seven-goal tally from Finn Russell. Glasgow have created a culture of dynamic rugby and made sure in the opening exchanges that they were not going to abandon this style of play. Their reward for an attacking mind-set came after only four minutes after the ball had been switched from right to left creating the smallest of gaps for replacement wing Leonardo Sarto to squeeze through Munster's stretched defence for a glorious try. Finn Russell converted before adding a penalty goal but what had seemed one-way rugby suddenly changed as Munster found their mojo, the men in red attacking from a five-metre scrum by putting the ball wide to the left and then switching the direction of play with a long pass that allowed centre Rory Scannell to dive over in the corner. Tyler Bleyndaal missed the conversion, before slicing a penalty kick. 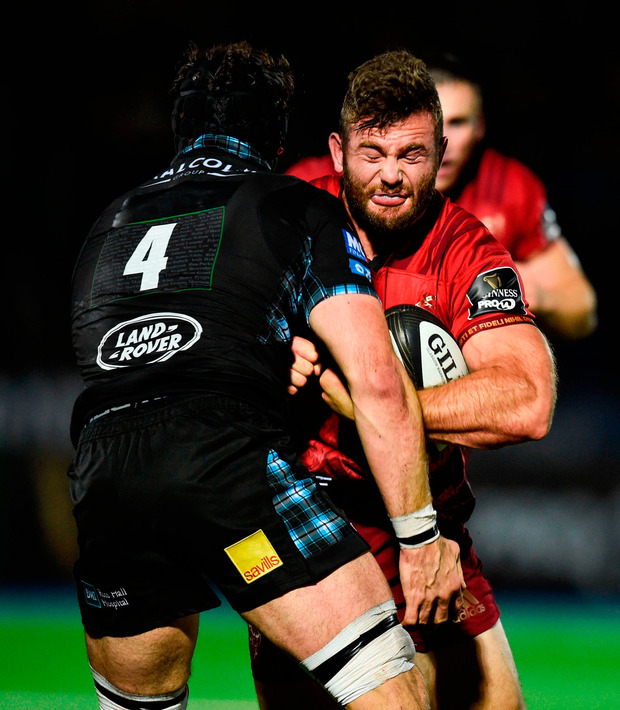 Meanwhile, Russell showed his unflappability by kicking his second penalty goal and then converting a spectacular try by Lee Jones after Glasgow had attacked from the restart with a run up the right touchline by flanker Callum Gibbins, leaving Warriors 20-5 ahead at half-time. 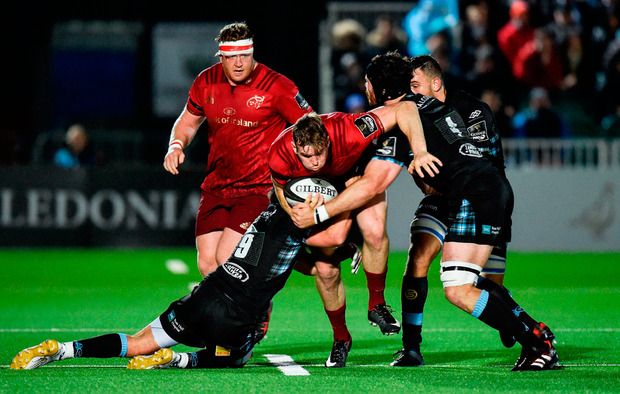 Munster's woes continued at the start of the second half when second-row Billy Holland was sent to the bin for a maul offence. 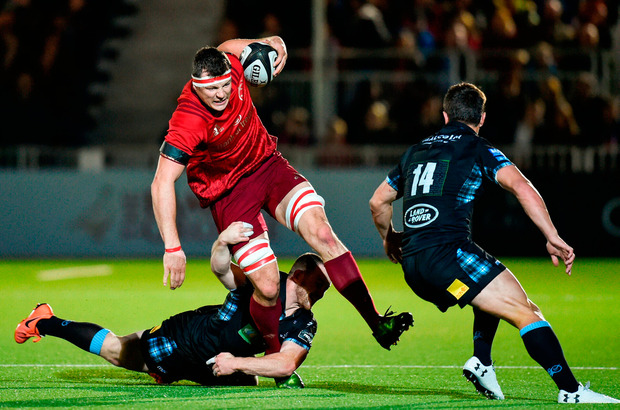 Glasgow quickly made their extra man count, launching their backs into action that ended with a long pass by Peter Horne to Jones whose inside flip rebounded back off Adam Ashe and into the hands of try-scorer Nick Griggs, Russell again converting. Glasgow's scoring rhythm was interrupted when centre Chris Farrell intercepted a somewhat laboured pass to romp in for an unconverted try. But it was soon back to business for the Scotstoun team as the Warriors forwards drove a maul, the end result another penalty goal by Russell, the out-half's sixth success from the tee. 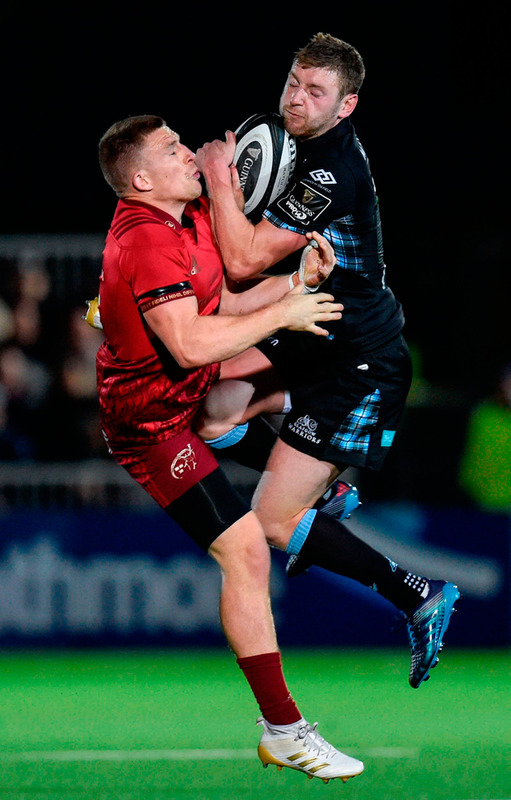 Munster had a chance to reply from a penalty touchfinder by Rory Scannell only for Glasgow to 'steal' possession at the line-out. It was the trigger for Glasgow to return to high-tempo rugby and minutes later the Warriors claimed their bonus-point try after a surging run by Sarto gave second-row Scott Cummings a try under the posts. Russell then non-chalantly put over his easiest kick of the match. The visitors tried desperately to salvage something from the game but their pick-and-drive tactics close to the Glasgow line and then a wide pass to Simon Zebo came to nought. When replacement Fineen Wycherley was shown a red card in the 75th minute for reckless play at the ruck it really was all over for Rassie Erasmus's side. Glasgow - R Jackson; L Jones, N Grigg, P Horne, R Hughes (L Sarto 2); F Russell (S Johnson 39), A Price; J Bhatti (A Allan 56), G Turner (P MacArthur 56); Z Fagerson (D Rae 56); T Swinson, S Cummings; R Wilson, C Gibbons, A Ashe. MUNSTER- A Conway; D Sweetnam ( S Zebo 46), C Farrell, R Scannell, A Wootton; T Bleyendaal ( J Taute 48), D Williams (J Hart 48); L O'Connor ( D Kilcoyne 51), R Marshall (N Scannell 54) S Archer (J Ryan 64); D O'Shea, B Holland; S O'Connor (R Copeland 18); T O'Donnell, J O'Donoghue ( F Wycherley 39). REF - Nigel Owens (Wales).